What is the Best iPad Pro 12.9 Case With Keyboard Available? There are some excellent choices for your iPad Pro 12.9 case with keyboard. These are readily available and can help you be more productive with your emails, spreadsheets, and much more. Discover here the Best iPad Case Keyboards for your needs. You should check the Apple’s compatibility webpage for more details. Take a look at the Apple Website here. The Apple iPad has generally been considered as a device you primarily use for consuming content, however, the Apple iPad Pro 12.9 inch model has changed all that. Obviously it can still be used to browse the internet, or watch films. With it’s new features and accessories such as the Apple Pencil, it is just as convenient to do office work with as it is to sketch on. The iPad Pro has an on-screen keyboard that makes use of the additional resolution. This allows for the inclusion of dedicated number keys and shortcuts to cut, copy and paste. It makes typing without a dedicated keyboard a lot more convenient than with the old iPad keyboard. However, with the addition of an external keyboard, combined with a protective case, this could truly become a laptop replacement. Here are the Best iPad Pro 12.9 Case With Keyboard that you can buy. The Snugg keyboard with cover is a case design which totally protects your iPad Pro. It combines a wireless Keyboard which allows your iPad to rotate 360 degree. It has a smart and sleek design that is also resilient. Securely slotting your iPad Pro into this ultra-thin case is very simply. Pair the wireless keyboard over Bluetooth with your iPad is also very easy. The keyboard features include a home screen key, as well as shortcut combination keys. No separate batteries are required as you can charge the keyboard via the provided USB cable. When detached, the keyboard has an operating distance of 10 meters. This is ideal if you need to share your screen with a group while still controlling your iPad from the keyboard. 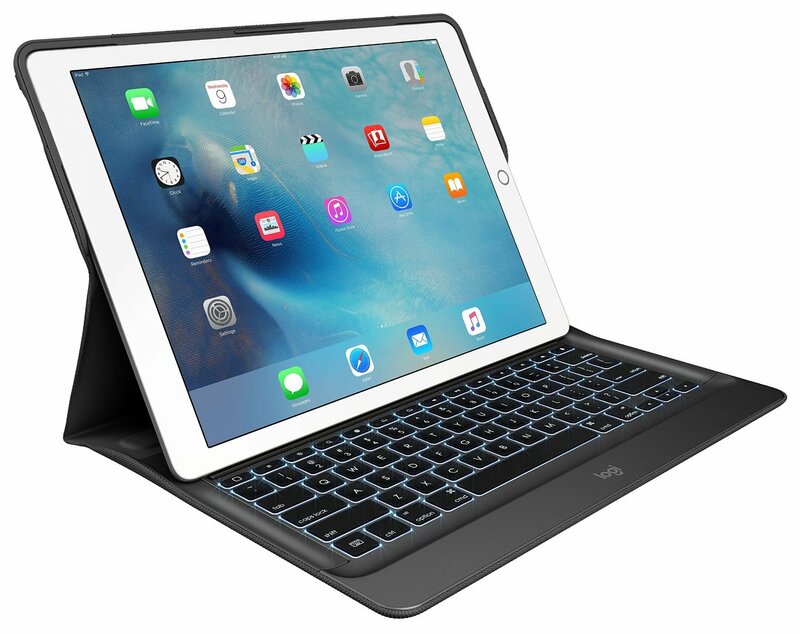 The innovative Logitech Create iPad Pro Case with keyboard allows hassle-free accessibility with a sleek look while protecting your iPad Pro 12.9 from damage. This keyboard case has been exclusively designed for the Apple iPad Pro 12.9. As a top-grade tablet case with keyboard, it offers many excellent features that are all designed to enhance your experience while using your iPad Pro. This keyboard case does not require Bluetooth pairing with your iPad Pro and does not require separate charging. The keyboard is powered directly by your iPad Pro. The keyboard has large backlit keys with adjustable brightness that allow you to use the keyboard in the dark or in low-light conditions. It additionally features a dedicated row of iOS shortcut keys as part of it’s full size layout. These keys allow you to adjust the screen brightness, control audio volume, and search the web with just one press of a button. The Logitech Create iPad Pro Keyboard Case is water-repellent and provides all-around protection for your iPad Pro with it’s precisely fitting anodized aluminum structure. It provides camera, headphone and four-speaker audio holes. The outside made of woven fabric that resists spills and other potentially damaging elements. The Logitech Create can be used in dual viewing angles. In an upright angle, it is ideal for watching television, movies, and videos. When it’s time to get on with some serious work, the typing orientation makes writing emails and drawing extremely easy. There’s no need to press the power button every time you want to access your tablet as it comes with auto wake and sleep functions. It is strongly advised to use a Screen protector for your iPad Pro 12.9 with this keyboard case. IVSO Apple iPad Pro 12.9 Case With Keyboard is an ultrathin detachable Bluetooth Keyboard / Stand / Case. It has been exclusive design for Apple iPad Pro 12.9 . It has a high quality PU leather cover and soft, microfiber-lined interior that provides full protection for your tablet. The Airbender Apex is a wireless Bluetooth keyboard case that has been designed specifically for the Apple iPad Pro 12.9 inch. The design is very stylish that provides good overall protection. The Bluetooth connection is reported to be extremely reliable and does not required to be continually paired with the iPad. This is a neat compact and lightweight design that weighing just 21 oz complete with your iPad fitted. This model supports several viewing angles with the Airbender Apex’s hinge design. It has metal foldable handle stand that allows 90 to 120-degrees of stable tilting angles as well as for travel. ZAGG have recognised that some of the owners of an Apple iPad Pro 12.9 want to use it instead of a laptop by turning it into an alternative to a MacBook. This has resulted in a keyboard case that greatly resembles one of Apple’s laptops. Additionally, this keyboard case turns the iPad Pro 12.9 into a 2-in-1, offering some features a MacBook doesn’t have. 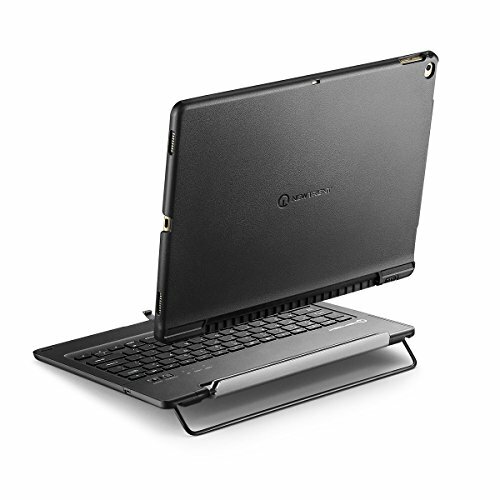 The slim book can convert this tablet into clamshell laptop. However, as the base needs to be heavy enough to hold the top stable, it adds additional weight. The keyboard resembles the ones found in Apple MacBooks. It has normal-size keys with plenty of space around them. There is a set of iOS function buttons across the top of the keyboard. The keys are also backlit and offer a range of colors: red, white, purple, green, blue, and yellow. This is convenient when typing in a dimly-lit areas. The ZAGG Slim Book Ultrathin Case is not as protective as a completely rugged case and doesn’t do anything to completely protect the display. Yet, when it’s being used without the keyboard, this tablet is safer than having nothing at all. The The Snugg Wireless Bluetooth Keyboard Case Cover provides good value functionality and protection for your iPad Pro despite the inferior quality of the cover. This, however, helps maintain a light weight. 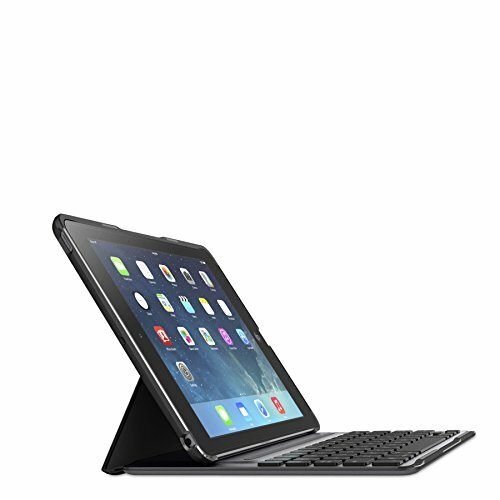 The Logitech Create – Backlit Keyboard Case has been exclusively designed for the Apple iPad Pro 12.9. The keyboard is connected to and powered directly by your iPad Pro using the Apple Smart Connector. The auto wake and sleep functions help conserve battery life. The IVSO Apple iPad Pro 12.9 Case With Keyboard offers 3-In-1 functionality: Bluetooth V3.0 keyboard + Stand + Premium Carrying Case, that make its extremely convenient to carry and offers good protection. It is let down by limited battery life. The New Trent Airbender Apex does not add much weight to the iPad and is very convenient for transport. It is sturdy, and the stand on the back allows for the keyboard to be slanted to your preference without hindering the stability. The ZAGG slim book for 12.9-inch iPad Pro turn your tablet into a 2-in-1, tablet and laptop replacement. Its best feature is a large, backlit keyboard. However, the downside is that it adds a lot to the of thickness and weight to a tablet. There also some concerns as to the robustness of the hinge. What’s your favorite iPad Pro 12.9 Case With Keyboard? From our list of cases with keyboards for the iPad Pro 12.9, which iPad Case With A Keyboard would you consider? There will surely be more to choose from in the coming weeks, if none of these pique your interest. Let us know how you prefer to tackle your typing on the new iPad Pro 12.9 by leaving a comment in the appropriate box. It would seem to be a minefield when trying to buy the right case for the iPad Pro. I have yet to buy my new iPad but knowing how expensive the case was for the iPad I have, I was quite surprised at the price which seems very reasonable for Apple. Being in the UK, I suspect it will be a tad more expensive here! Thank you so much for all your work in showing the pros and cons of these cases. It certainly has made my choice much easier to make. I will keep a lookout!